Developed to allow for high penetration and a firm hook-hold, Gripz alleviate slippage as the flesh of the carp's mouth grips into the grooves under pressure but is easily removed on release, lessening any mouth damage.  Uniquely designed point, resulting in a seriously sharp hook.  Made from the highest quality Japanese wire.  Teflon coating for dull finish. A great deal of research has gone into finding the best hook for our Stonze System Stumpy rigs and we believe these are the best hooks not only for our ready-tied rigs, but for whatever style you are fishing, be it bottom fishing, zig-rigging or surface fishing. 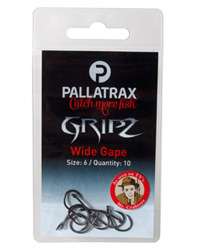 So rather than launching a range of hooks, Pallatrax have 'The Hook' - a very sharp and sticky with a short shank, straight eye and slightly inturned point. The Hook is perfect for any presentation. Available in barbed and barbless. 10 hooks per packet. Consisting of an extremely high quality, fine dyneema with breaking strains of 15lb and 25lb. Coated in its unique material, this low-visibility hooklink has resulted in some incredible hauls and, when used, you will quickly see why. The big brother to its sister hooklink the Steamlink. The specialised, low-visibility, matt coating that is easily removed revealing the dark 30lb breaking strain dyneema inner core. The material really comes into its own when fished over rough and snaggy ground or for continental carping, especially amongst mussels. This high quality, fast sinking braid in natural green is available in 12lb and 15lb breaking strains. High Quality fluorocarbon hooklink meterial in 12 and 15lb breaking strains. Each Stumpy Rig is hand-tied in the U.K. using The Hooks from our range to ensure consistent quality. Each rig comes with a Stonze attachment so simply add a Stonze and you have a competent and confident terminal set up. 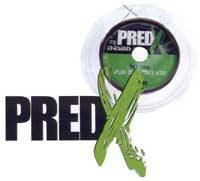 You have the choice of either 12lb or 15lb fluorocarbon, 12lb or 15lb braid, size 6 or 8, barbed or barbless. The rigs are unique in their length (approx. 3) as the concerns for a lead no longer exist, and we believe that shorter hooklinks are by far the most effective. Again hand-tied in the U.K., these Stumpy Rigs have been specifically designed for continental carping when fishing the Stonze System. Tied using our exceptional Snaglink material, the angler benefits from an extremely effective hinge-rig, which can be used confidently in multiple fishing situations  especially over snaggy ground or amongst mussels. Each rig comes with a free Stonze Connector and is available in size 2 barbed, and size 4 barbed and barbless. For best presentation, hold the rig taut over the steam of a kettle to straighten the hooklink, resulting in the perfect hinge-rig. Take care not to scald yourself or knock the rig against the spout of the kettle.